This rope is very similar to the lightest Japanese jute (asanawa) costing many times as much! Asanawa Tossa Lite is made from tossa jute, as used in Japan, which gives a stronger rope that ages beautifully and is much darker than White Jute. It comprises 3-plies made up of double yarn threads, instead of the single yarns more common in Japanese rope, to create an extremely light, yet durable rope. This is my lightest and most flexible rope due to the looser lay (twist). The double twisted yarns provide excellent resistance to 'high-stranding', i.e. going out of balance, common with loose laid ropes. 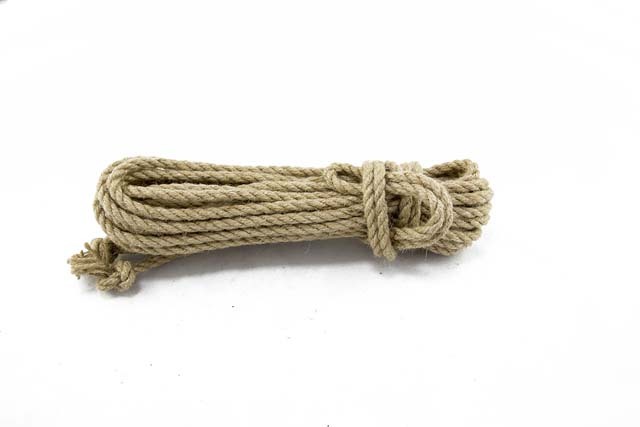 This 100% natural jute rope is supplied as 8m ropes finished with an overhand knot. The 6mm is around 5.7mm and the 7mm is about 6.8mm. This rope is much more like the original Tossa as the lay is tighter but the weigh is around 25% less and it is also flexible enough just to be dry treated. The fibre and consistency of manufacture are superior to the other members of the Lite family.